Hands to work, hearts to God. ~ Ann Lee, known as Mother Ann to the United Society of Believers in Christ’s Second Appearing, also known as the Shakers. The Shakers have always fascinated me. They were charismatic Christians, but now most people know them for their craftsmanship, particularly in furniture with simple lines, and for their architecture. A religious society with a doctrine of celibacy is one that does not flourish and in 2012 there were only three Shakers left according to Wikipedia. Still, I do agree with the quote above. I know that it seems like my posts are flipping back and forth from the shallowness of the material world (reorganizing my home) to the depths of some spiritual issues, but I find that home projects often provide my mind time to rest on my Lord. It is as if He is given me a season, without a church home, to straighten out my home and enlighten me on some spiritual matters at the same time. I have many home projects to do and, apparently, a great deal of spiritual matters to work on as well. For just a few dollars I bought these at a Goodwill store. I think it all was for around $6. I did not exactly had a plan for how I would use them at the time, but I knew that I would use them. The first thing that was used was the napkin holder (front), just to corral the small bottles and other odds and ends used for our pets that end up on the counter instead of the pet supplies basket in the utility room. This was one of those things that I planned to not have there in the long term, but would do until I could get to rearranging some other things so they would have a better and yet convenient place. The place I had it on the counter turned out to be more short lived than I hoped, because my husband had purchased another juicer, a NutriBullet that would fit best where my little corral of pet stuff was. Of course, when my husband goes on a trip for work, his new juicer goes with him, but he uses it daily now, even when he is home, (even though we have had a VitaMix that will do the same) so it needs to be on the counter for convenience. So, temporarily the corral is on the now-not-so-organized bar and we have a counter to the left of the stove that is practically devoted to juicing, even with its own cutting board. Before you wonder why we now have three juicers, the new one as I mentioned is like the VitaMix but smaller and will not always be here; both are basically high-power blenders. The other is an extractor but unlike most extractors, this one grinds between two gears so that it can even be used to make freshly exacted wheat grass juice. 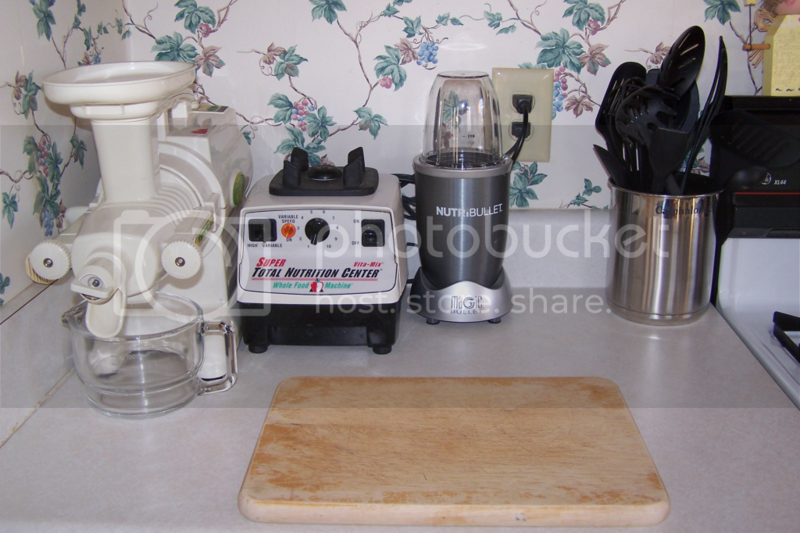 We have been using all our juicers more lately, much like when we used to do for several years, but years ago. I really do not know how and why we stopped for such a long time perhaps it was during the baby-toddler years, but we are into juicing being a daily dietary routine again. 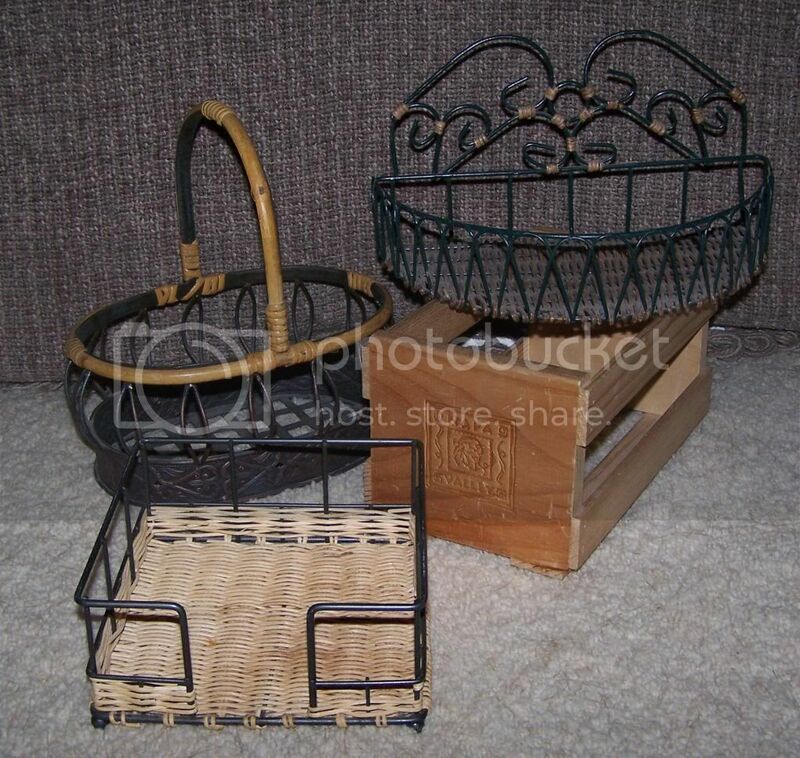 Back to my thrift finds, I have no idea just yet for what I will use the wire basket, but I leaning towards using it for a plant somehow. I had several possibilities for the small wooden crate for CDs, but it ended up in my kitchen placed on its side to house a food scale and a small timer, allowing the shelf to sit on top to use the vertical space. It may not stay there, but for now I like what it is doing. I am very pleased that, so far, my family is adjusting to the changes and not undermining them by putting things back the way they were or just leaving things out.